In large bowl, beat cream cheese, shredded Monterey Jack cheese and green onions with electric mixer on medium speed 1 to 2 minutes or until blended. Add 1 can enchilada sauce and green chiles on low speed. Stir in chicken. Spread heaping 1/3 cup chicken mixture along center of each cooked lasagna noodle, to within 1 inch of one short end. Roll up firmly toward unfilled end. Line 15x10x1-inch pan with foil. Place roll-ups seam side down in pan; cover loosely with foil. Freeze about 30 minutes or until firm. Place frozen rolls in two labeled 1-gallon freezer bags; label. Freeze up to 3 months. Heat oven to 350°F. Divide 1 of the remaining cans of enchilada sauce between baking dishes, pouring over and down sides of roll-ups. Cover tightly with foil; bake 40 to 50 minutes or until hot and bubbly. Meanwhile, in 1 1/2-quart saucepan, heat remaining can of enchilada sauce over medium-low heat until hot. 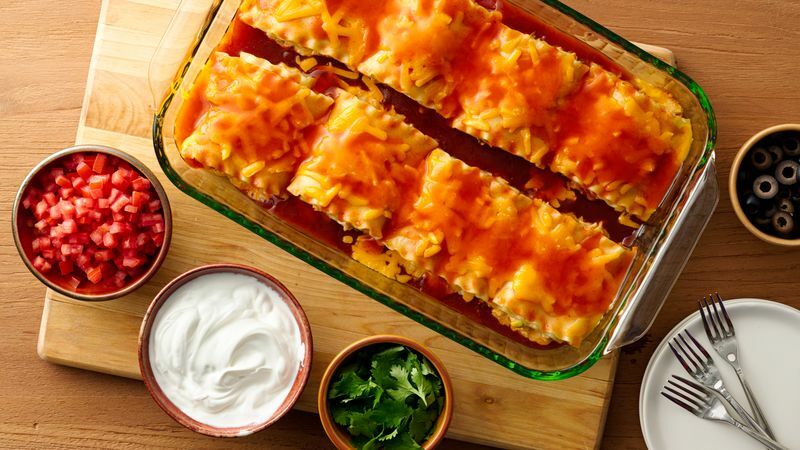 Remove foil; sprinkle each dish with 1 cup sharp Cheddar cheese. Bake 3 to 5 minutes longer or until cheese is melted. Let stand 5 minutes before serving. Spoon remaining sauce over rolls. Top with tomato, sour cream, cilantro and olives.